The Cattier Organic Brin de Douceur Day Cream, with its soft and slightly pink texture, moisturises, nourishes sensitive skin and improves its overall comfort. Cell'Intact®, a protective active ingredient derived from buckwheat, creates a shield that durably protects the skin against pollution and other external aggressions. It neutralises everyday stressors and reduces sensations of heat. The soothing properties of organic brown linseed complete this effect by calming and relieving irritation. Day after day, redness and sensations of tingling and tightness gradually fade away. Pink clay softens, soothes and restores the skin's radiance. With Cattier Organic Soothing Day Cream for sensitive skin, the skin is moisturised and protected, its softness and comfort are restored. 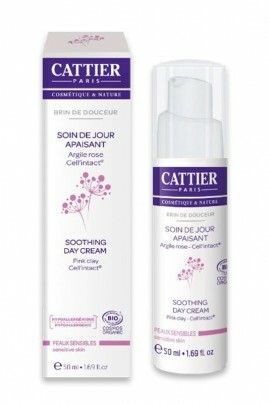 CATTIER Brin de Douceur Day Cream for a brillant skin ! Every morning, apply to the face, the neck and the décolleté. Natural ingredients for sensitive & reactive skins !